1. Its a thin paperback book. 2. It is a short, easy to read, devotional type book. 3. It is not full of non-essential words, as there is only one page per verse. 4. It includes a lot of Biblical encouragement. 5. 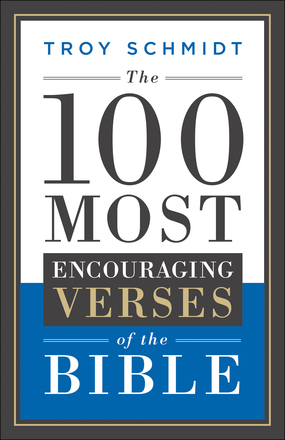 It includes many familiar and expected verses, but also includes many I had never thought of as being encouraging. The book I am talking about is The 100 Most Encouraging Verses of the Bible by Troy Schmidt. And Sarah said, "God has made me laugh, and all who hear will laugh with me." If you like quick, easy devotional-type books, this would be a good one to have on your nightstand. You can read about one or two verses as you start your day, or pick it up before you shut the lights out at night. I have been encouraged by the book, and I think you will be also. I received a free copy of this book from the Bethany House Blogger Review Program for the purpose of this review.